This entry was posted on August 5, 2014 by Jessica Anderson. Concerned with Employee Retention? Consider Giving Service Awards! At Trophies2Go, we have a service awards program. Here is Margene with at her 10 year anniversary award! As a manager or owner of a business, are you concerned about employee retention, engagement and satisfaction? If so, consider adding Service Awards to your HR tool belt. These types of awards acknowledge an employee’s year(s) of service to the company. This is especially important when employee turnover is an issue. The cost of an awards program is small in comparison to the cost of employee acquisition and training. Service Awards Programs have been proven to be successful in increasing job satisfaction and improving employee retention. Whether a large corporation or a small nonprofit, all employees like acknowledgement for the time they have served an organization. Below are some basic steps for establishing a Service Awards Program. 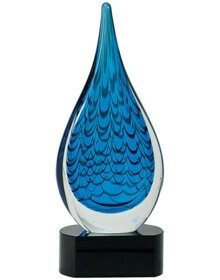 Art Glass Awards, such as this Blue Rain Drop, make great Service Awards. Recipients can display with pride for years to come. Step #1: Establish Time Periods For Awards. Standard time periods for presenting awards are 1, 2, 3, 5, 10, and 20 years, but can vary depending on the type of work. - Well established companies: Recognition at the 1, 5, 10, and 20 year mark is appropriate. - Start-ups or companies with higher turnover: Gifts at the 1, 2, 3, 5 and 10 year mark may be necessary. Even six month awards can be useful if the typical employee lasts less than three months in a position. Step #2: Determine Your Awards For Each Time Period. Typically, more employees qualify for awards in the 1-5 year time frame. Begin with less expensive awards and grow to more significant ones as years of service progress. Add variety to your awards program. Consistency is good, but don’t give the same gift each anniversary date. 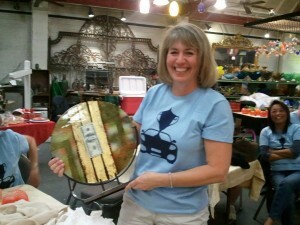 One idea is to alternate an award with an edible or useful gift every other time period. From our years of experience, below are some common service awards companies have given to their employees. - For earlier years: Acrylic awards are a great choice. Some examples include the Acrylic Ice Block, or Peaked Acrylic Awards. - For the middle years: An award plaque would be appropriate. Another functional gift choice is an engraved clock. - For someone with 15 or more year of service: Consider a crystal trophy or art glass award. These high quality awards add beauty and class to any surrounding. Step #3: How To Present Awards In A Meaningful Way. Service Awards can be given at staff meetings, company functions, teambuilding events or individually. However, recognition must come from the leaders of the company in order to be meaningful. Presentations should be made by a direct supervisor or someone higher up in the company, such as the VP or CEO. Do not have the award sent to the person without direct acknowledgement by a supervisor; that diminishes the value of the award. Once a Service Awards Program is created, it is important to stick to it. Follow through shows a company’s commitment to its employees. Below are four examples of text that can be used on Service Awards. These are only guidelines; be creativity to capture the essence of your company. Service Awards Programs are great tools for motivation, recognition and employee retention. Your employees deserve to be recognized in a meaningful way for the time and expertise they give to your company. In return, that recognition will add value to your business in the form of satisfied employees!